One of the methodologies to achieve positive social change that really interests me is the concept of Outcome-Based Payments. I recently saw a great example launched by The Big Issue, one of my favourite charitable organisations. Shelter estimates that there are about 300,000 people classified as homeless in the UK, with the National Audit Office estimating that there are about 4,450 people sleeping rough on any given night. These are shamefully high numbers in such a rich and developed society as the UK. How do Outcome-Based Payments and Social Impact Bonds work? Social enterprises and charitable organisations target the social improvements that they want to achieve. They find the relevant local authorities that would benefit from having these challenges dealt with and then enter into contracts with them. These contracts guarantee that the organisation will receive a certain payment once a measurable improvement has been made, known as an “Outcome-Based Payment“. The organisation then provides the service in question and measures progress via the agreed methodology. Once this agreed target has been met, the local authority releases the agreed payment. Of course, there is a delay between the provision of the service and the payment, meaning there is a need for startup capital. This capital can be issued in the form of a bond that is linked to the future income stream of the Outcome-Based Payments. Therefore, these bonds are often referred to as “Social Impact Bonds“. Why are Outcome-Based Payments important? This is a great model for local authorities because it means that the payments are made only after successful outcomes are achieved. This means less taxpayer money is wasted on schemes that don’t work and it also means that funds can be diverted to the most effective strategies, obtaining maximum impact for the local authorities. 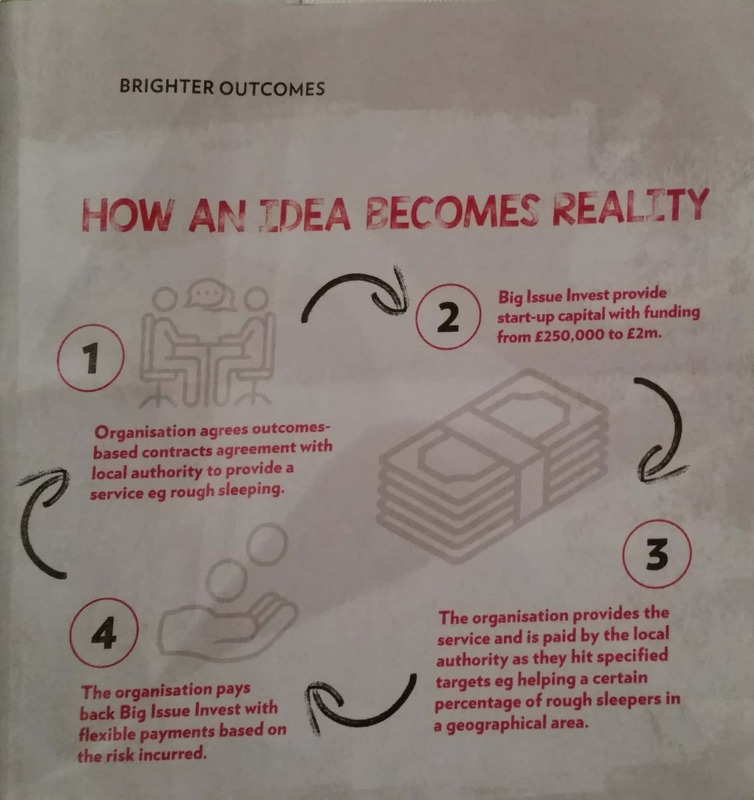 Big Issue Invest, the social investment arm of The Big Issue Group, launched the £10m Outcomes Investment Fund to target just these sorts of opportunties. How could this work for homelessness? Big Issue Investm via its Outcomes Investment Fund, has backed Changing Lives in its target to get 150 rough sleepers in Newcastle and Gateshead into long-term accommodation. I think this is a fantastic model that has potential to stimulate improvements for many other social challenges, such as mental illness. What other organisations invest in Social Impact Bonds? A non-exhaustive list of organisations that would make these sorts of investments are listed here. This entry was posted in Uncategorized and tagged business idea, charity, government, homelessness, innovation, social enterprise, social impact bonds on 17/12/2017 by davidjohnkaye.